The best whole house water filters don’t just clean your water – they make your water taste better, smell better, and feel better! A whole house system helps your washing machine and dishwasher perform better, your coffee taste better, and your skin feel better after a hot shower! There is a lot to think about when it come to whole house filtration systems, so before investing in a whole house filter, here are some important features to know about before buying. Filter Capacity: The filter capacity is how much water you can run through it before it needs to be replaced. Some of the systems we reviewed require you to buy filters separately, so we’ll let you know their capacities if we can! Contaminant Removal: We’ll also let you know the percentage of contaminants each filtration system removes from your water. Some filters are “sediment only,” so they won’t have a percentage rate, while others remove microorganisms, chemicals, metals, and more from your water system. Flow Rate: Flow rate is how many gallons per minute your filtration system can handle. Lower flow rates are great for apartments or small homes, while later flow rates are great for large homes to provide clean water without sacrificing water pressure. Stages: We will also let you know how many stages of contaminant filtration your whole home system uses to cleanse your water! You can choose the level of water filtration that is right for your home, your family, and your budget! Size: Since a water filter has to hook up to your water main, you’ll want to measure your space before choosing a filter – especially if your water main hookup is in an awkward area like a crawlspace or under a sink! Warranty: A warranty means that the company stands by their product and that they will fix or replace problems if they happen. If something does go wrong, you can get the problem corrected and get your water back to sparkling clean! Now that you know more about what to look for, let’s get into the best whole house water filter reviews! We found 10 whole house filtration systems that we think will work great in a variety of homes! Whether you have hard water, city water, well water, or just want better tasting water, we found a system for you! If you’re short on time, start with the Top Pick and Budget Pick below, and come back to read the rest! Our Top Pick for the best whole house water filter goes to the iSpring Water Filtration System because it cleans the water throughout your home without sacrificing water pressure! 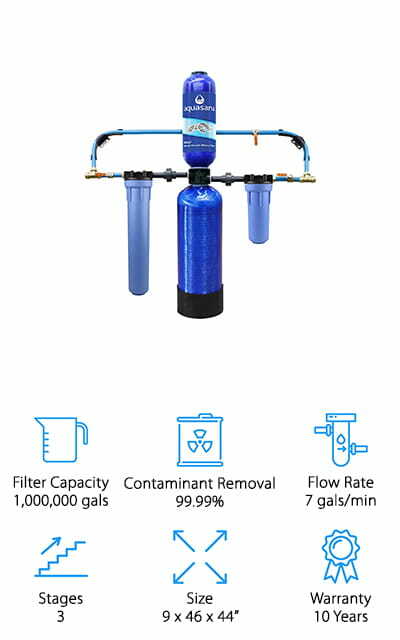 This 3-stage system removes up to 98% of contaminants from your water, leaving you with clean, odorless, safe water the whole family can enjoy. The sediment filter removes large particles, making this our favorite for the best whole house water filter for well water. The next 2 stages are carbon filters that remove smaller particles like chlorine, VOCs, and other things that affect the look and taste of your water. We also like that this filtration system leaves in the healthy minerals you want in your water, and works well alongside a water softener to keep even hard water clean! It’s also easy to install and maintain because it has a pressure release button that shuts the system off from the water main to replace filters or install a new system. Our Budget Pick is also our pick for the best whole house water filter for sediment! This inexpensive system is great for city and well water to remove sediment, dirt, and rust. We like that this sediment filter has a clear housing cover, so you can see the buildup and know when it’s time to change your filter. It also comes with 2 extra filters, so you don’t have to worry about buying more filters for a while – a great bonus for homeowners on a budget! This unit is also incredibly easy to set up! It uses 3/4” fittings, which is standard in most homes, so you don’t have to worry about getting extra adapters or tools. It also has a bypass valve that allows you to stop the water flow to the filter when it’s time to change the filter and clean the housing cover. We think this system would also work great alongside a water softener system, too! If you’re looking specifically for the best whole house water filter to remove chlorine, this system from Aquasana is great for getting rid of the smell and taste of chlorine from your water! 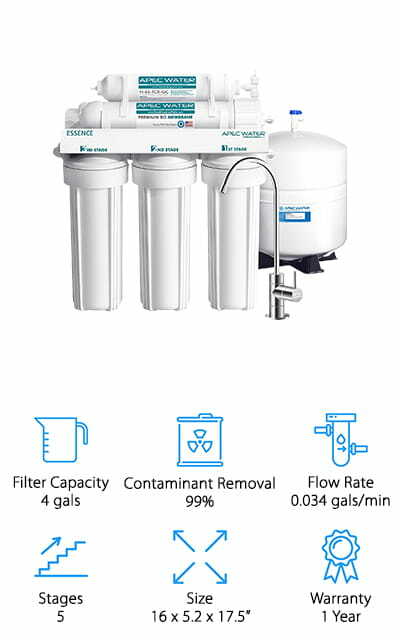 This 3-stage system gets rid of up to 99.99% of contaminants, and it clears out more than just chlorine! The sediment filter gets rid of large particles like dirt, silt, and rust to prevent them from clogging the main filters. The main filter removes up to 97% of chlorine, so your water will smell and taste better. It also filters out hard metals and prevents bacteria from passing through. The final stage is a sub-micron filter that catches organisms and cysts, so your water is healthy and clean to use for drinking and cooking. We think this is the best whole house water filter for chlorine because it’s easy to install and works hard to keep the water throughout your house clean, odor free, and tasting great! 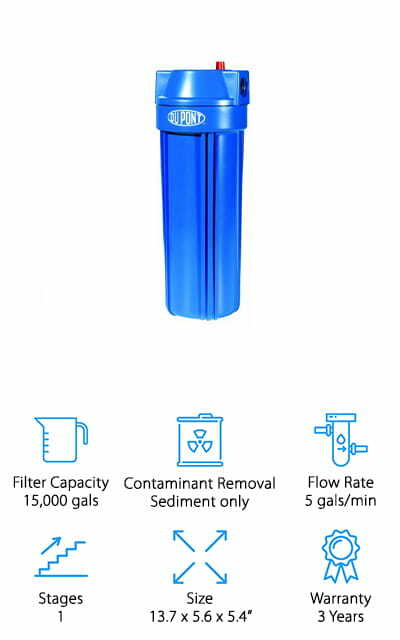 This filtration system from DuPont is another of our favorites for the best whole house water filter cartridge for well water! We like this system because you have the option to use this in a variety of places, including the home and office! It’s easy to hook up into your water main, thanks to the 3/4” fittings and pressure valve that makes installation and replacing filters quick and easy. We also like that this sediment filter is inexpensive, so you can replace it every few months without spending a ton! 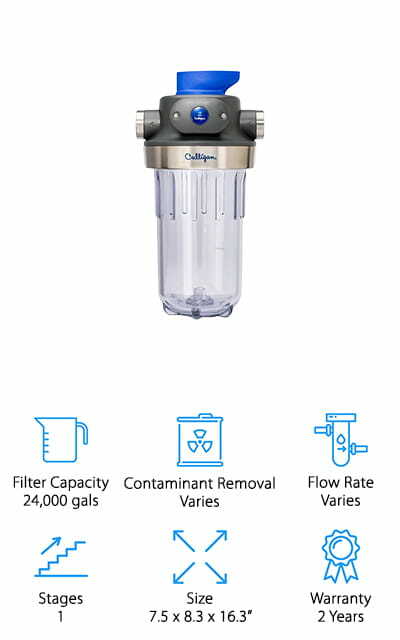 You can also use different filters from DuPont in this unit, so you can swap in a carbon filter to improve the taste, or add a hefty filter for smaller particles. We like that you can even buy a few of these and create your own 2 or 3-stage filtration system if you’d like! They’re inexpensive and easy to set up, so it’s up to you what you can do! If you can’t hook up a whole house system to your water main, another option is to use a system under your kitchen sink. 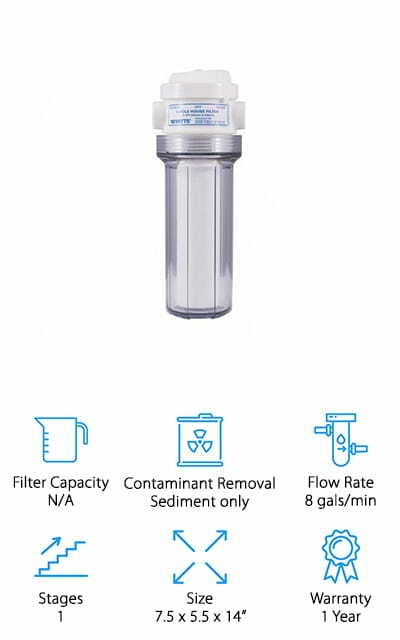 This system from APEC is the best whole house water filter to remove fluoride and chlorine for apartments, condos, and other spaces where it’s difficult to get to the water main! This system is easy to install and comes with all the fittings, tubing, and tools you need to hook it up in a few hours. 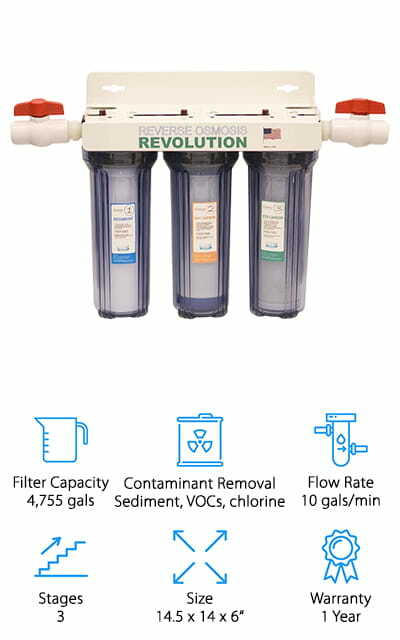 This 5-stage filtration system removes up to 99% of contaminants, such as chlorine, fluoride, microorganisms, metals, and more! It also has a chrome faucet you can hook up at your sink for safe, clean drinking water on demand – which is also great for making coffee and tea taste its best! 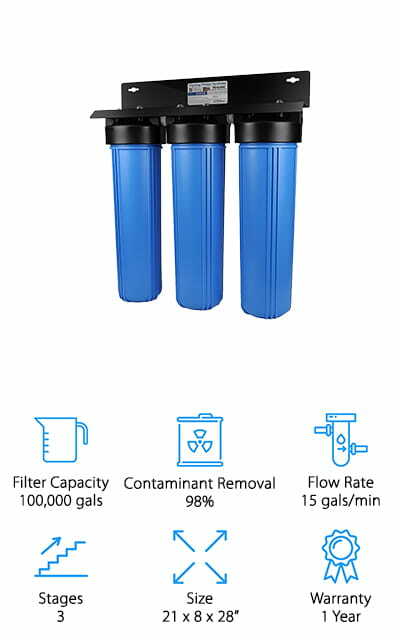 We think this is the best whole house water filter for city water that removes chlorine and fluoride to give you safe, clean, odorless drinking water for the whole family! Next up is our pick for the best whole house water filter for rust, a heavy-duty system from Culligan! This system can be hooked up to your water main, attach it before your water softener, or install it under your kitchen sink. Once you hook it up, you can install whichever Culligan filter you’d like (sold separately). We like this system because you can customize it to your needs – you can get a single-layer filter for city water, or get a 3-stage filter for well water or extra rusty city water! You can even hook up more than one in a row for extra cleaning power! It comes with everything you need to install it, and it has an indicator light that tells you when it’s time to change the filter. This filtration system gives you cleaner, better-smelling water and helps to keep your home appliances like dishwashers, washing machines, and faucets in great condition for years to come! Another whole house sediment filter we like is this system from 3M because it’s incredibly easy to use and keeps your whole house’s water clean! We like that this system filters up to 20 gallons per minute, which means you can get clean water without sacrificing water pressure. This single-stage filter is easy to install and comes with everything you need to hook it up to your water main quickly. We also like that the filter and housing come as one unit, so all you have to do to replace the filter is unscrew the old one, and then screw in the new one. No cleanup, spilling, spraying, or frustration! The filters last up to 100,000 gallons or about one year, depending on how much you use your water. This is great because it saves you time and money on replacement filters! If you want a whole house filtration system that’s low maintenance, this is a great place to start! When looking for the best whole house water filter and softener add-on, this system turned out to be one of our favorites! You can hook this 3-stage system up before your softener system to filter hard water before it gets to your softener. This ensures your softening system is working its best by preventing clogs and damage from sediment and other contaminants! The system filters out all kinds of contaminants, like sediment, rust, chlorine, fluoride, pesticides, and more. We like that it also cleanses the water of common chemicals and metals that affect the taste and smell of your water, so you can feel good about drinking it or cooking with it. It’s also easy to install, and it has 2 valves you can shut off when it’s time to replace or clean the filters! Oh, and this kit comes with an extra set of filters, so you don’t have to buy replacements for a while! What a great deal! Another favorite of ours for the best whole house water filter for hard water is this 2-stage system from Home Master. This would make a great companion for your current water softening system, filtering the water to ensure your softening system stays clean and in proper working order for years to come! This first stage of this system removes sediment, silt, rust, and other large particles that affect the look and cleanliness of your water. The carbon filter is made of coconut shells, and it eliminates up to 95% of contaminants like chlorine and unwanted chemicals, leaving your water odorless and tasting clean! 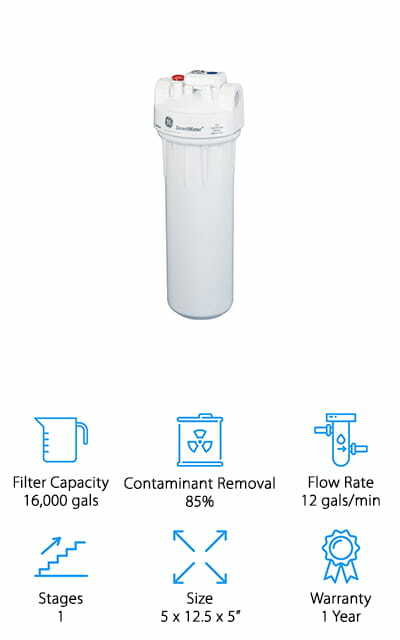 We also like that the filters on this unit are extra large and it uses 1-inch connections, so you can filter the water throughout your whole house without losing pressure! The larger filters can clean up to 100,000 gallons of water, which for a family of 4 should take about a year before needing to replace them! Last up in our best whole house water filter systems reviews is this inexpensive, yet hard-working system from General Electric! This single-stage filtration system hooks right up to your water main for clean, clear water throughout your home. It’s great to drink and to improve appliance performance, clean your laundry better, and improve your hair and skin while you shower! 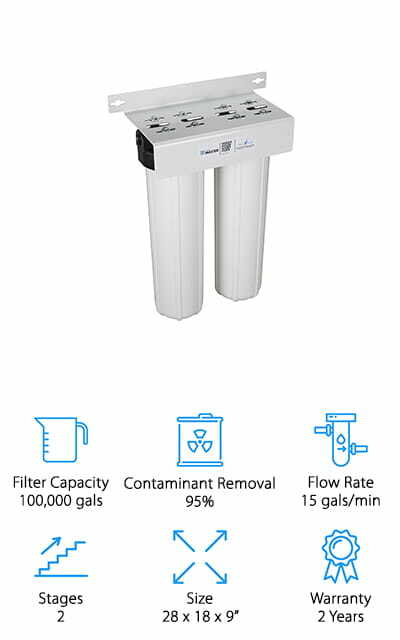 This system is easy to hook up, and you can use it with a variety of filters that GE created to individualize your filtration system. 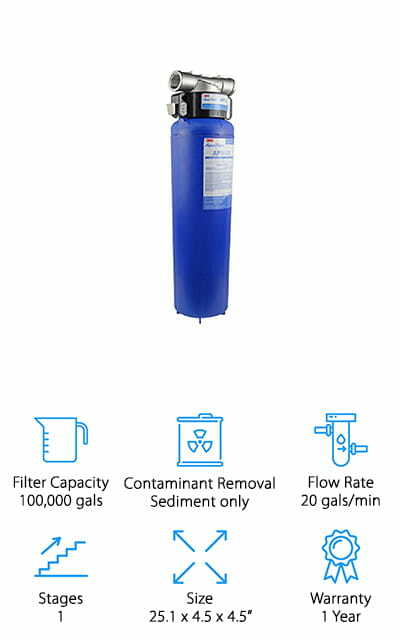 It comes with a filter that reduces sediment and other particles like rust, chlorine, and more. We also like the compact design, making it great for using in apartments or condos under the sink if you can’t get to your individual water main! The filters are also inexpensive and easy to replace, and the remote filter indicator tells you when it’s time to switch out your filter without needing to check it in person!